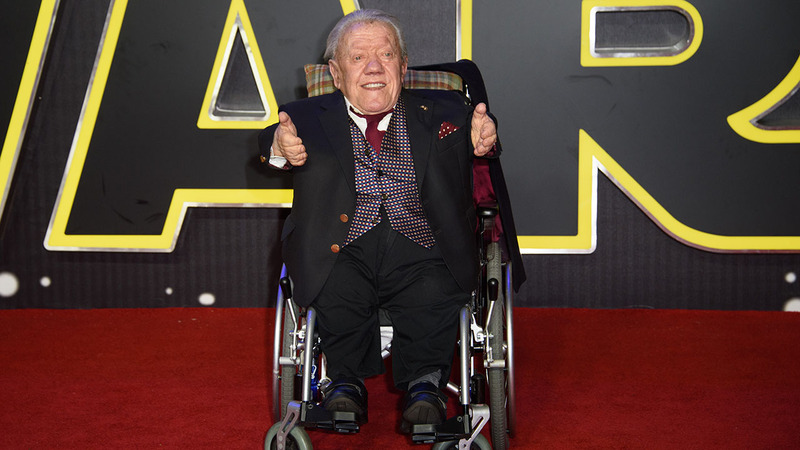 Kenny Kenny Baker, the 3-foot 8-inch (1.1 meter) actor who played R2-D2 in the "Star Wars" films, has died. He was 81. Baker's nephew and carer, Drew Myerscough, said he found Baker dead Saturday at his home in Preston, northwest England. Myerscough told Sky News that Baker had suffered years of breathing problems, "which he had borne very bravely." He said the affection of "Star Wars" fans around the world "kept him going, without any doubt." "He was amazed that, even after 30-odd years, the fans still basically adored him," Myerscough said. Baker's agent, Johnny Mans, confirmed his death, and said: "He will be sadly missed." Actor Ewan McGregor, who played Obi-Wan Kenobi in three "Star Wars" movies, tweeted: "So sorry to hear about this. It was lovely working with Kenny." Born to a music-loving family in the central England city of Birmingham on Aug 24, 1934, Baker started performing at 16 as part of a troupe called "Burton Lester's Midgets"
Baker told The Associated Press in 1985 that Burton had asked him "What can you do?' I said I could roller skate, ride a bike and whistle. I joined them and did all that, and conjuring tricks, played drums and comedy routines as well." Baker later worked as a DJ and circus clown, and as half a comedy-musical duo called the Mini-Tones. Fame came when he was cast as the actor inside R2-D2's cylindrical robot costume in 1977's "Star Wars." "I worked the levers," he told the AP. Even though R2-D2's dialogue amounted only to beeps and whistles, the lovable droid and his lanky friend C-3PO became two of the series' most beloved characters. Baker returned for "The Empire Strikes Back" and "Return of the Jedi." and reprised the role in three prequels released between 1999 and 2005. He also appeared in films including "The Elephant Man," ''Time Bandits," ''Willow" and "Labyrinth." Baker's wife Eileen died in 1993. The couple had two sons.